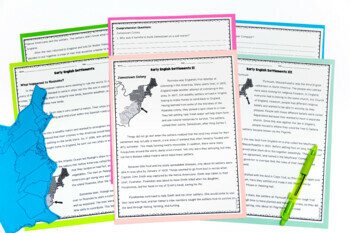 This social studies resource is a complete unit for the 13 Colonies or Colonial history of the United States. It details how the colonists came from Great Britain to the new land to build the thirteen colonies. It documents where they settled, the demise of early colonies, hardships, and successes. 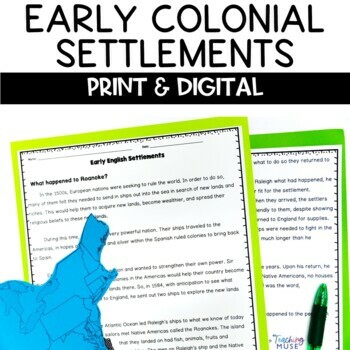 This teaching activity will give your social studies students knowledge of the first colonial settlements in America as they begin their studies of the 13 colonies. Students will learn about Roanoke, Jamestown, and Plymouth. They will learn their locations and what caused their demise, hardships or success. 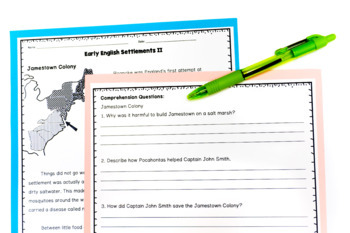 Two versions of the worksheet are included to allow your students to answer questions as they read or wait until after they have learned information of all three settlements. 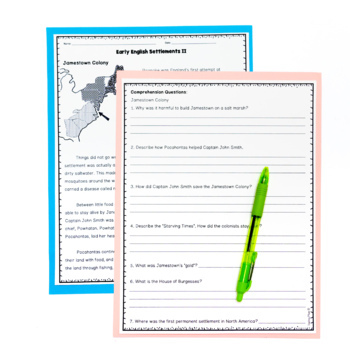 This packet is great as an introduction and ladder to connect European explorers with the thirteen colonies. I loved this packet. My kids did it for homework and they enjoyed learning about the different colonies. This was perfect for my 5th grade students. We read and practiced highlighting/annotating to help us answer the questions. Thanks! So easy to use and implement into the classroom right away! This resource went VERY WELL with our Social Studies unit. We touched on everything in this packet and it made a nice "end of the chapter" review/reteach resource!